Spinit Casino is a brand new offering from Genesis Global Limited Casinos that was launched in 2016. The crew at Spinit Casino consists of a bunch of casino enthusiasts who've all been players in their lifetimes and thus know exactly what players are looking for. They've taken their skill and experience to put together a fantastic online casino package that should be set to provide their members with everything they've ever dreamed of. Spinit Online Casino has been licensed by both the UK Gambling Commission as well as the Malta Gaming Authority. This allows them to provide their services to most countries around the world with a few exceptions, mostly in Europe such as Denmark, Hungary, France, Italy, Israel, Portugal, Romania, Spain, Turkey and the United States. To accommodate their diverse player list, they offer their website in English, German, Finnish, Norwegian and Swedish and have also included a wide list of currencies which is simply too vast to list here. It is clear from the description on their website that they have the experience needed to pull off this project although only time will tell if they are as skilled as they claim or if they too, like so many others, will go down in flames. In order to deliver on their promise of providing only the best of everything their customers desire, Spinit Casino has partnered up with several of the most reputable software developers in the industry including NetEnt, Microgaming, Play 'n Go, NextGen Gaming, NYX Interactive and Elk Studios. Each one of these developers has years, and in some cases decades, of experience and has brought to life some of the very best casino games the world has ever seen. Haven't heard about Play 'n Go before? Swedish software developer Play 'n Go might not have quite the reputation of Microgaming or NetEnt but their years of experienced has given has turned them into a must-have brand for any online casino. Although primarily focused on the European market, Play 'n Go's casino games may be found at countless casinos from all around the world. Most of the games from Play 'n Go are developed in house and with around 60 games to their name, which may not be as impressive as other big software companies, you can be sure that all their games will be of only the highest quality. Using the developers listed here, we expected great things from the title selection at Spinit Casino games section and we were definitely not disappointed. Along with some of the best slot games in the industry, they also have a live casino, table games, video Poker, scratch cards, Keno, spinning wheel games, and more. In fact, they currently host a staggering total of over 1,200 casino games which could very well be one of the largest collections of any online casino. Don't You Just Love Slots? As can be expected, the main focus here is on their slot offerings and as such hundreds upon hundreds of slot games to choose from. Each game has the option to play for fun first so those who don't enjoy putting their money on the line before knowing and understanding the game will be able to take some time to get to know it first. When Pigs Fly and Aloha! Cluster Pays are among the top favorites of Spinit Casino's players. No video slot collection would be complete without a few branded slots from the latest and hottest trends and of course the list at Spinit is no exception. Some of the popular branded slot games here include the rock 'n roll trilogy from NetEnt, The Invisible Man, Aliens, Robin Hood: Shifting Riches, Jack and the Beanstalk and Frankenstein. While video slots are great fun, there are still those who prefer the old fashioned 3 reel slot games and once again spinit.com has their players covered. Did You Say Table Games? Next we'll make a turn at the table games section where once again we are wowed by the number of options. That said, they have made it slightly difficult to see which game is which since the games are presented in a tile format and each game tile shows an image of the game it represents. In some cases the name of the game is engraved on the table being used in the image while others don't include this meaning players need to mouse over that image to see which game it is. While this is not a problem when the game selection is small, when you have this many games you want players to see exactly what each game is so they can browse less and play more. Of course the table game selection includes all the usual suspects such as Roulette in American, English, European and French versions, Blackjack, Poker, Baccarat, Punto Banco, Red Dog and Pontoon. Each game type is available in at least two or three versions so there are plenty to choose from. There are those players who enjoy playing from the comfort of their own home but also enjoy a bit of company while doing so. Those are usually the players who seek out the casino games that feature live dealers where they can interact with the dealer and players for some social experience. Spinit Casino offers another impressive list of games here although this section suffers from the same fault as the table games in that the names of the games are not listed until you mouse over the tile. The live casino at Spinit Casino contains several iterations of the following games, Roulette, Blackjack, Baccarat, Caribbean Stud Poker, Casino Hold'em and Texas Hold'em. As if this wasn't already enough, there are also good numbers of video Poker, scratch card games as well as other games that are simply added to the "Other Games" category. Special promotions is the one area where casinos can really stand out from the competition as they can offer anything they wish. This is not only effective in attracting new players but also in keeping existing players interested and happy. Here is a breakdown of the special promotions currently on offer. The welcome bonus at Spinit Casino offers new players the chance to receive up to $1,000 and 200 free spins. This is not done all at once though and has been spread across 4 initial deposits. The first deposit will earn players a 100% deposit bonus up to $200 and they'll also receive 200 free spins which is paid out in portions over 20 days. These spins may be used at the popular Starburst slot game. The following deposits don't provide any further free spins but a lot of extra cash as can be seen below. The minimum deposit required to qualify for this bonus is $20 and of course any bonus funds are subject to a wagering requirement which needs to be met before those funds may be withdrawn which in this case is 40 times the bonus amount. The wagering requirement will need to be met within 14 days or players will forfeit the bonus. Full terms and conditions apply. Read here. All participants must be 18+. Every Wednesday will see members at Spinit being presented with the game of the week. Any member who's deposited and played in the last week will qualify for this bonus in which they will receive free spins on the game in question. They will also receive a bonus when making a new deposit. Qualifying members will receive a newsletter every week with details on the promotion. After the weekend spirits tend to a somewhat low when having to think of heading back to work again. Luckily the brand has a remedy to help brighten up the first day of the work week. Any deposits made on Mondays will be subject to a 25% deposit bonus up to $100. To gain the most from this offer players will need to deposit $400 and receive an additional $100. A minimum deposit of $20 is required for this offer and players will need to meet the standard 40x wagering requirement. In addition to the offers already listed Spinit Casino offers randomly selected promotions at any time of the week. When a promotion has been started, all qualifying players will be notified and given the details. These promotions could include free spins, deposit bonuses or simply cash prizes. The top menu that is visible on all pages presents a support option. Selecting this brings up a drop down menu with options such as FAQ, Chat, Contact Us, Forgot Password, Account Activation, Rules and Security and Payments. As far as support systems go, this is one of the most efficient we've come across. Their FAQ section is also well stocked with information with several sections to browse through and several questions under every section. Should the FAQ section not be able to answer a member's query then they may still contact customer support either via phone, email or live chat. Most members will opt to use the live chat function but those who prefer other methods will be pleased to find several email address for the various departments as well as a number of country specific phone numbers. One thing to point out though is that their support does not run 24/7, but rather only works from 08:00 to 24:00. But that shouldn't be a problem for most. Spinit casino payment methods are somewhat limited when compared to the competition although most of the major options have been included and are available for deposits as well as withdrawals. Maestro, Mastercard, Neteller, PaysafeCard and Visa: the choice is yours. Withdrawals also include the option of selecting bank wire transfers. Once a withdrawal has been requested it will go through an approval period which takes up to 24 hours. After that an additional delay will apply depending on the payment option selected with eWallet payments taking only minutes while bank transfers and card payments may take 3 to 4 days. As far as processing times go this is rather impressive. 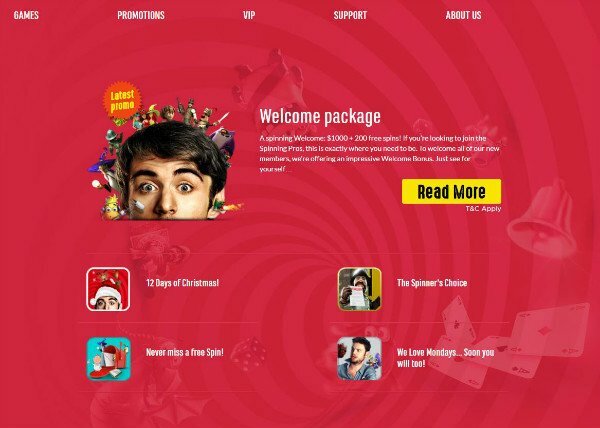 The web design at Spinit Casino has incorporated a lot of bright and vibrant colours and mixed in some characters from various famous slot games such as Jack from Jack and the Beanstalk, Gonzo from Gonzo's Quest and the skeletons from Spinata Grande. This website is a fun place to be and is also incredibly easy to use. The navigation bar at the top is big and provides all the important options. Our only gripe in this area is the games layout which has been mentioned before. Browsing through the slot games is generally not a problem because the preview images tend to include the game's name, but this is not the case when searching for a live casino or table game in which case the preview image doesn't give any indication which game is being shown and the player will then need to move his mouse pointer over every tile to see which game it is. That said, the games section includes a sorting panel with options to view New Games, Popular Games, Jackpot Games, Video Slots, Classic Slots, Video Poker, Table Games, Live Casino Games, Scratch Cards and Other Games. If that didn't make things easy enough, there's also a search function when looking for a specific game. As far as new casino's go, few have impressed us as much as spinit.com. Their claim that most of their crew members used to be players and thus know what to bring to the table seems to ring true since there are few things to complain about at Spinit Casino. The games selection is out of this world with over 1,200 games on offer over a wide range of categories, all that's missing here is Bingo. Their special promotions offers a good number of bonuses for new and existing players with the promise that more, frequent promotions will be presented. They also have a good VIP program that will make their most important members feel really special. With the exception of the game layout that makes it difficult to distinguish certain games, there's not a lot of negative comments to be made here. If this is how they perform in their first year then we can already see a bright future ahead of them and we look forward to seeing them grow into a phenomenal online casino.